Feeling lucky? There was a time that Google's web search claim to fame was the "I feel lucky" button. You knew that there was a web page that you wanted to get to but you didn't know the URL. The lucky button was intuitive. The lucky button was a godsend and saved people countless seconds. Google is even more intuitive today. Start keying in strokes and Google tosses up options as you type. Some have turned these options into Google poems. The practice of forming Google poems is popular enough that a website dedicated to Google poetry – Google Poetics – popped up last fall. Google poems have been featured in places such as The Huffington Post and The Telegraph. And now, The Bar None Group. Here are a few of our examples...with a slight editorial touch in some cases. What did you come up with? Excellent found art! Sometimes the genius is in packaging what is presently not being appreciated! Somewhat Zen-like packaged in bits and bytes. Cliche is the armature of the universal! Google brings home the truth of old Jarry's saying. Dada and beyond methinks! These are a lot of fun, Mark. Hope all is well with you. So true... Fun post , Mark. That's too fun! 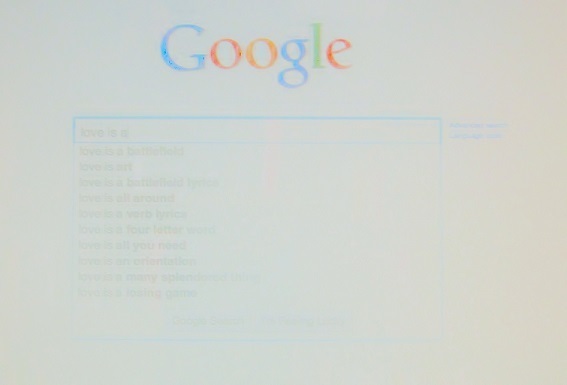 I've never heard of Google Poetics before.